Welcome to Kids Get Crafty. On Monday the 6th December was St Nikolaus day. In Germanic countries this is celebrated with St Nikolaus visiting the children and bringing them Satsumas/ Mandarines/ Clementines, nuts and dried fruit. 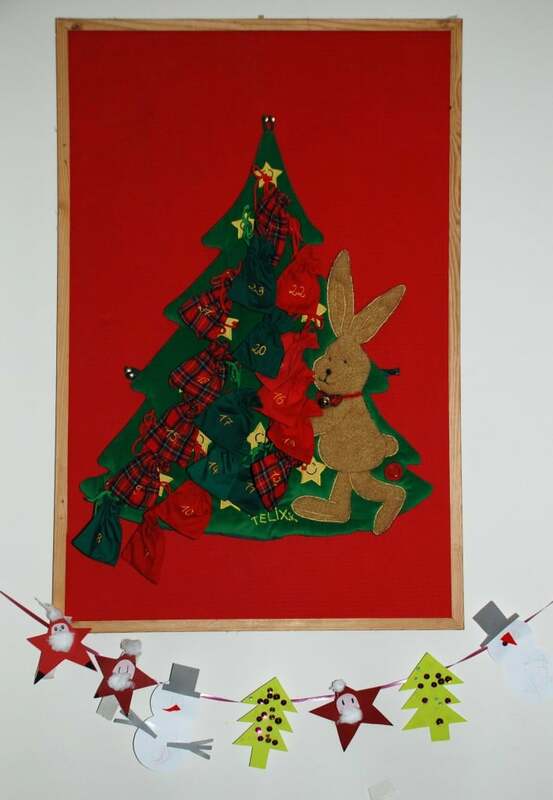 The specific tradition varies from country to country and family to family, but at our house, IF Red Ted has been good (!) we leave a little basket outside the bedroom door (traditionally it is a shoe or boot) and St Nikolaus comes during the night and fills it with goodies! 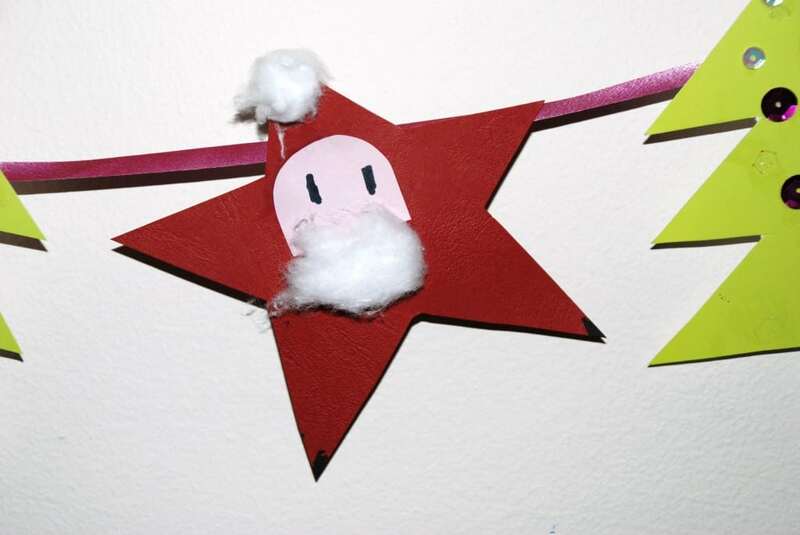 To celebrate, we also made a little “Nikolaus Stern” or “Santa Star”. This is a widespread craft and I really cannot take any credit for it. Non the less, it is cute! 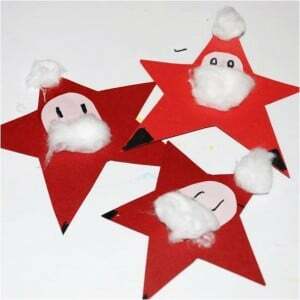 These darling Santa Stars were first published in Dec 2010 and have been updated and republished for your convenience. Hang on your Christmas Garland: we have our Christmas Trees, our Snowmen and now our Nikolaus’s. 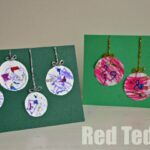 Red Ted was SO excited to see them all together and insisted on attaching them himself (with some masking tape). It was the first thing he showed Daddy when he come home in the evening! What a lovely tradition, and I like your Santa star! This is lovely. I am definitely going to make a lovely garland like this with Milo to hang up. 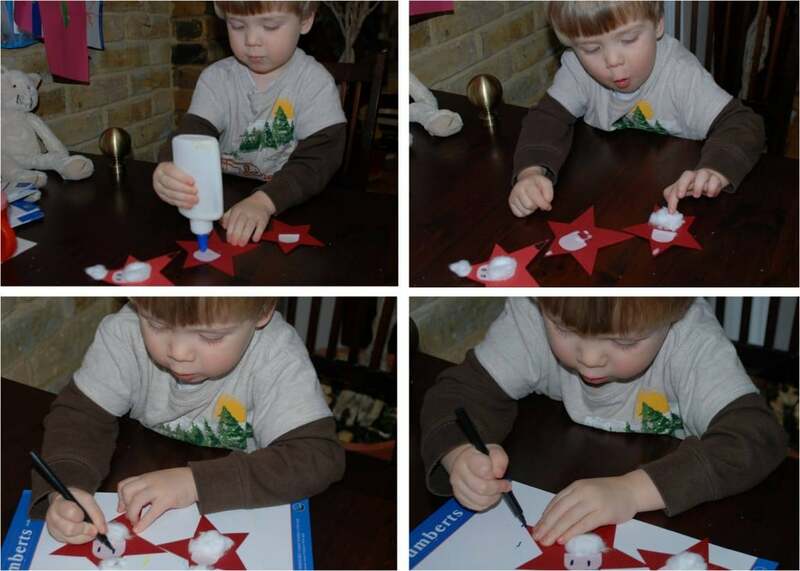 He is enjoying the Christmas crafting a lot at the moment – our house is permanently covered in glitter! The Santa starts are great! Such a cute craft. 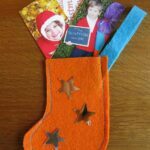 Quick and simple crafts are often the best! 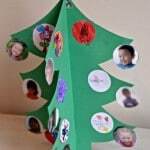 cute idea- will save this idea for our annual st nicholas event at chruch (which i’ll be in charge of again!). was the book worth buying to copy illustrations for kids to color (ie scan and put into cartoon form?)? That Santa is so cute, though I have been avoiding Santa crafts as we don’t “do” Santa and I want to focus on the true meaning of Christmas. Not knocking anyone who does include Santa, it’s just something I don’t believe in. I like that the book shares the true story of Saint Nicholas. When Santa comes up around here I am careful to make sure the girls know there was such a person once. Sorry the book didn’t live up to your expectations. That would make a cute ornament for the tree, too. I wonder if I can find wooden stars? What a sweet craft! Looks great. I love the Santa Star. That is so cute! BB will love doing this, I bought a bumper bag of cotton wool yesterday and we are planning to get really crafty this weekend! I love the Santa garland. You are so right about simple crafts coming together to make beautiful things. Thanks for linking to Read.Explore.Learn. I have Stumbled and tweeted about your post. That garland turned out really lovely. Oh how amazing.. Love the little faces of the little one. Thanks for stopping by for my Round Robin..
adorable! those stars are so cute! Thank you all for your lovely and kind comments!! We are very much enjoying our Santa’s and Red Ted is so proud of himself!!! That’s such a cute craft. My husband’s family celebrate St. Nicholas’s day- but I didn’t grow up with it and I always forget.. until my MIL gives my boys a sock of stuff. I guess I’m going to have to try and remember as they get older! Looks like a great craft and easy too. Gorgeous! My Little Man also has to show Daddy his crafts, sometimes before he’s even completely in the house after work ;-)! Very pretty craft, and I like how it works on your chain with Christmas trees and snowmen! We celebrate Nikolaus as well even though I was very tempted to leave the shoe empty this year, since daughter was particularly naughty on the Nikolaus Eve! Natalie – I know just what you mean!!! Our little ones do test us! (and Liz) As to the chain, it was a bit of a fluke! I never really thought of putting them all together like this until the very end! We were lucky it worked! Alethea – I love it when they take pride in their crafts! What a great craft– on that even I can handle! Thanks foe sharing it! 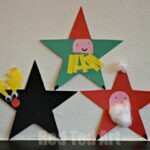 I just made the stars with my daughter and we had so much fun! They are not as well done as yours, but I’m sure the grandparents will love them. We attached little clothes pins on the back so we can attach them to presents. 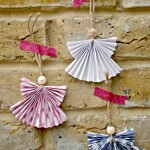 Texttussi – Oh I like the little clothes peg idea! Fabulous and you prob attach them to the tree that way too! 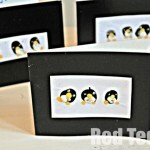 Lizzy_o – Yes, will do my best to remind you of crafts pasts!!! Hi Maggie. Thanks for your visit. Your blog is excellent. A huge. 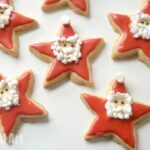 The Father Christmas stars are absolutely adorable. 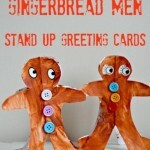 Awww thanks, haven’t made them in years, we need to revisit for sure! Awww I bet you are not really rubbish!!!!! Have fun. SO sweet! I love the fact it’s a star and a santa!